She also brought out *NSYNC and Nicki Minaj — though the latter appearance was marred in technical difficulties. 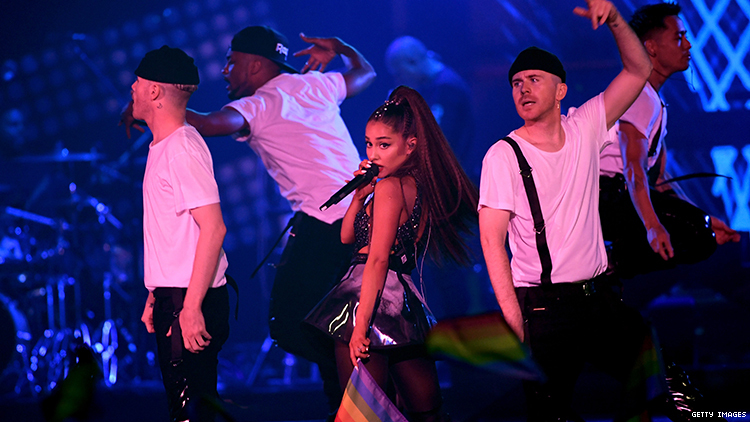 Ariana Grande put on her headline performance for Coachella Weekend One on Sunday night. The performance makes her the youngest headliner in the festival’s history — she is also the fourth woman to headline. As has become par for the course, Grande packed her set with surprise appearances and some of her biggest hits. Amongst the featured performers was *NSYNC — sans one member, Mr. Justin Timberlake. The group performed their hit “It’s Tearing Up My Heart,” after Grande announced “I’ve been rehearsing my whole motherfucking life for this moment.” She also had Mase and Diddy eventually join her on stage. And while those performances went over pretty well, it wasn’t all roses for Grande’s mainstage show. All in all, Grande ended up performing quite a few of her hits. “God Is a Woman,” “Break Up With Your Girlfriend, I’m Bored,” “No Tears Left to Cry,” and “Thank U, Next” amongst the chosen songs. She even covered Frank Ocean's "Close to You" from his album Blonde. Still, it might be the close of the performance that made the largest statement. For the finale, Grande had a Pride Flag projected on to all of the screens of the Coachella mainstage. The broadcast was accompanied by fireworks. It was seen — and likely, rightfully so — as an acknowledgement of the anti-LGBTQ+ donations of Coachella owner Philip Anschutz. As boycotting the owner entirely would prove almost impossible for an artist of her size given Anschutz’s many and varied financial holdings, taking up space in this way and broadcasting the message of queer acceptance sent the message to her queer fans that she stands with them.